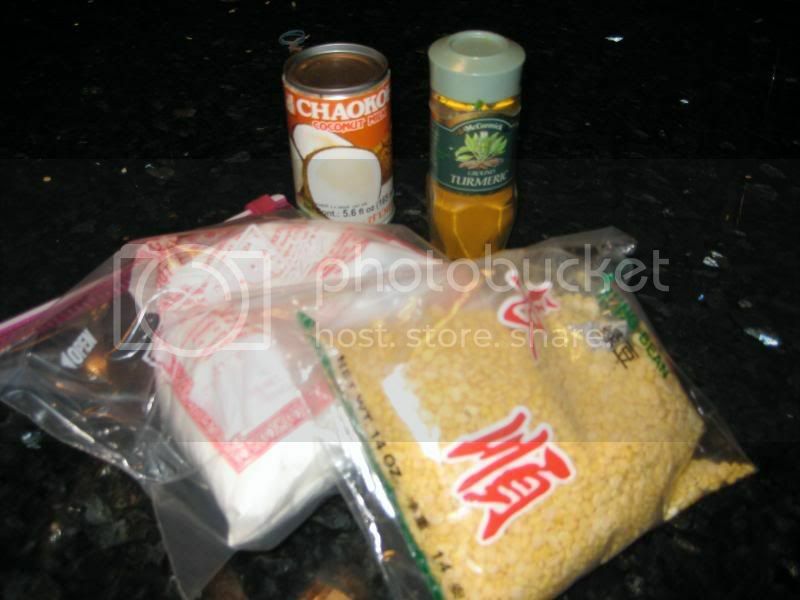 About a year ago, I picked up a packet of Banh xeo (Vietnamese rice flour crepe) mix at one of the Vietnameses grocery stores around Argyle/B'way. I decided to try it last month. The mix was pretty to simple to use--you just add coconut milk and water to the batter mix, then cook up the crepes with your favorite filling. It then occurred to me that making them from scratch was probably about as easy as making them from a mix (I don't know why it didn't occur to me sooner--I never make any other type of pancake/crepe from a mix). So, I pulled out a couple cookbooks and decided on trying the banh xeo recipe from the Alford/Duguid Hot Sour Salty Sweet cookbook. It was a cinch. You soak yellow mung beans for 30 minutes, then make a batter in a blender with the beans, rice flour, coconut milk and tumeric. The traditional filling is shrimp, pork, bean sprout and onions. I didn't have all of those on hand so I made a ground pork filling with lemongrass and garlic. The crepes from scratch were a little better (though the mix had almost exactly the same ingredients). This recipe is so easy--variations of this are going to become part of my regular dinner rotation. We ate this will a little nuoc cham (fish sauce, lime juice, vinegar, sugar, garlic, chiles), mint, cilantro and lettuce leaves. Looks delicious! 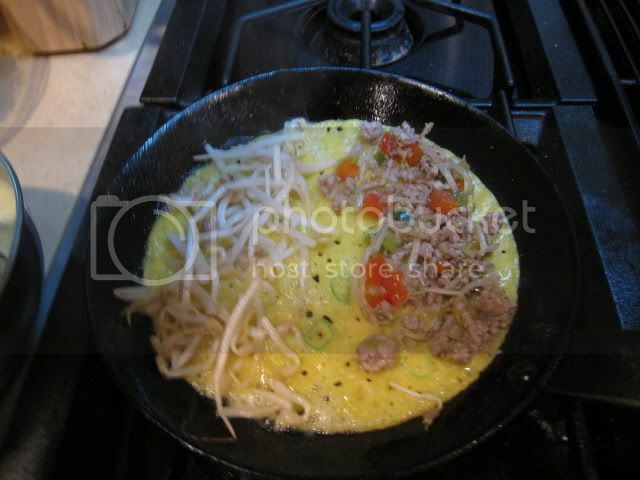 If I didn't know those were mung beans, I'd have assumed you were showing us an omelet. What are they like, texturally and flavor-wise? I'm always looking for ways to get more beans into our diet, this looks like a nice unconventional option. Thanks for your revealing this is a cynch to make. Often in ethnic stores there are products I am curious about, but don't quite know enough to pull the trigger. This goes a long way to encourage me to give it shot. I initially thought there must be eggs in these (or that they are fried in a lot of oil) to get that yellow color. But the color is actually from the beans and turmeric. I have have to admit (somewhat sheepishly--given that this is LTH), I've been trying to lean towards healthy recipes and low-fat substitutions after a recent high cholesterol result. So, the idea of a legume-rich recipe was appealing. Because the beans are blended, you really can't pick out their texture in the batter. But I think they could be used similar to lentils in other recipes. I also subbed 'lite' coconut milk (not pictured) and they still tasted great. I have an old steel crepe pan that I inherited and it doesn't require much oil, so this was actually a pretty healthy recipe. These are definitely in the 'cinch' category. 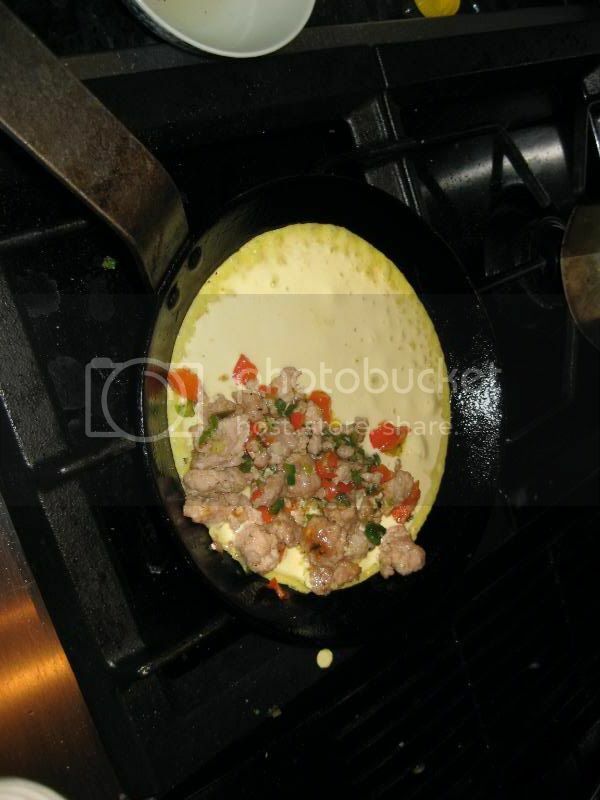 The crepe ingredients all have shelf life and the filling and accompaniments are pretty flexible. The mung beans only soak for 30 minutes and you can make the batter a day in advance. Obviously there's nothing scientific about my experience, but for this reason, I'm glad to find another way to use beans, especially a somewhat unconventional way (and also mung beans, which I've never used before.) Isn't turmeric also supposed to have an effect on cholesterol? Isn't turmeric also supposed to have an effect on cholesterol? According to the NIH, the scientific evidence is unclear (level of evidence 'C'), but hey, it can't hurt, right? And the turmeric gives the crepes have nice color and good flavor. thaiobsessed wrote: The crepes from scratch were a little better (though the mix had almost exactly the same ingredients). This recipe is so easy--variations of this are going to become part of my regular dinner rotation. Never thought of making Bahn Xeo at home. Looks delicious, I think I'll follow in your footsteps and give it a go. Very much enjoying your posting spree today. 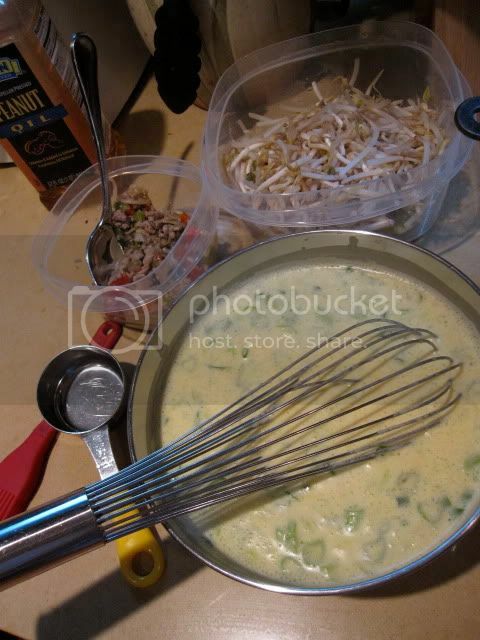 thaiobsessed wrote: You soak yellow mung beans for 30 minutes, then make a batter in a blender with the beans, rice flour, coconut milk and tumeric. I heart the crepes from Tank Noodle. Can't wait to give this recipe a shot. Thank you for posting the pictorial. Thought I'd add a little more of a 'recipe'. Oh wow- so that's what it's called.. I had this at Luc Thang and it was awesome. And no idea about the mung beans, also though there were eggs in there. Luc Thang really does good Vientamese. The only reason to go there. I almost tried a Thai version of these this weekend from the Beautiful Cookbook series for Thailand. We are gluten-free, so this is a great recipe for us--nothing to convert. 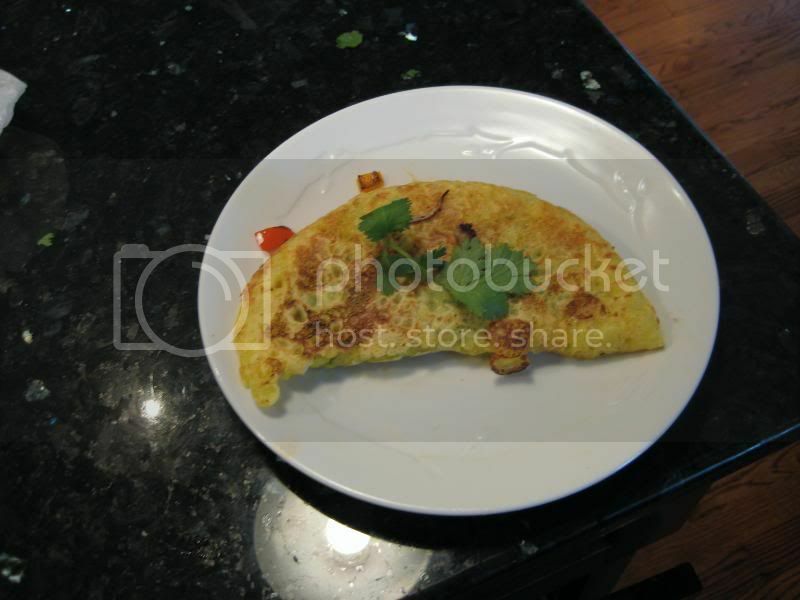 In the end, I tried a different item that was made with eggs - an omelet rolled up with a pungent paste inside. While it was good, next time I try these. Tried these for dinner last night, with a few failures - first of all, didn't have direction at the store and mistakenly bought whole "vietnamese mung beans" instead of moong dal (I'm going to try sprouting them.) Since I knew that I could make the crepes without and wanted to try them, I went ahead and did it anyway, beanless, using this recipe from epicurious and this one without beans that I found through random googling. My batter was very thin. I poured about 1/3 cup into a well-seasoned steel crepe pan (I wiped it with a wad of paper towels dipped in peanut oil). I putting the filling on the raw crepe. I think the trick is to let it cook a little longer than you think you need to before flipping. I did have a couple failures (presentation-wise) before I realized this. Another thing in my favor is that my crepe pan is pretty small so my crepes were 6-7 inches and much easier to flip than the big ones. I have continued to make Bahn xeo everyone once in a while and have made a few refinements in my technique. I'm fortunate to have inherited a well-seasoned steel crepe pan which is very forgiving and releases the crepes nicely. But I have had problems with sticking now and again. So, I went back and actually READ the recipe I've been using as a guideline. Turns out, you are supposed to cover the pan for a few minutes to steam the top. This has definitely helped alleviate the sticking problems. I generally use the batter recipe in Hot Sour Salty Sweet which calls for coconut milk, rice flour, dried mung beans, turmeric and salt--it's very easy to put together. You soak the mung beans for 30 minutes, then run the ingredients through a blender, then strain. The batter is better if you let it sit for an hour. I've been pleased with how these turn out but they are missing the crunchy exterior and slight chew of the Banh xeo I get from Hai Yen. This is a recipe that's pretty healthy and I try to keep from using much oil (which probably inhibits crispiness to some degree) but I've been on the hunt for other recipes. I really like Andrea Nguyen's cookbooks (I have Into the Vietnamese Kitchen and Asian Dumplings) and I noticed that her recipe for banh xeo batter is a little different, more involved. So this weekend I decided to make banh xeo two days in a row and compare the two recipes. 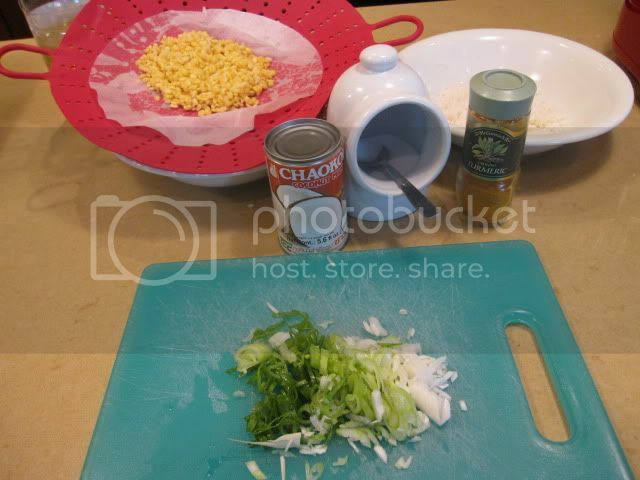 Ms. Nguyen's recipe calls for soaking rice 3-4 hours and soaking (2 hours), then steaming mung beans and blending those with a small amount of cooked rice, turmeric, coconut milk and salt and stirring scallions into the finished batter. This adds a few extra steps, but may be more pantry-friendly in that you don't have to have rice flour on hand. Also, you can soak, steam and grind the mung beans and then freeze them (she uses these for many recipes in her book). 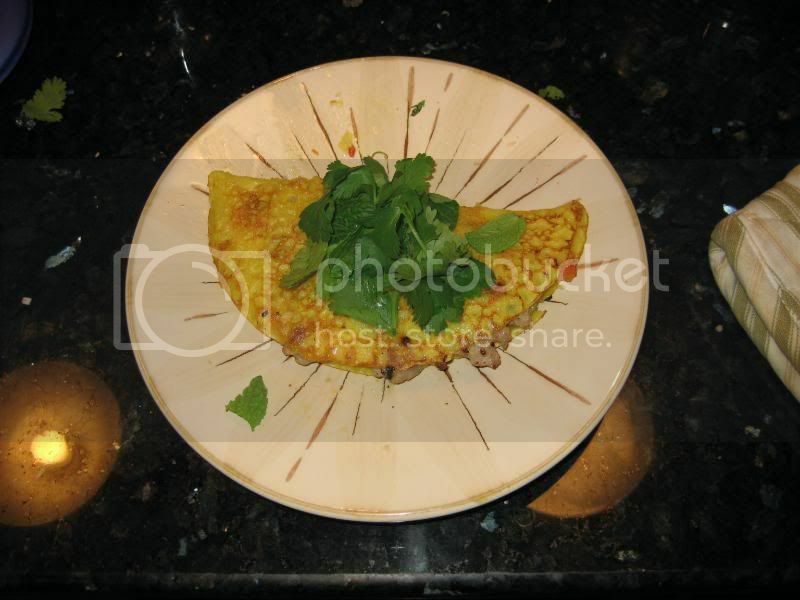 I still made a few alterations in the recipe--I make a lemongrass pork mixture to fill the crepes and I use my little crepe pan (about 7 inches) instead of the 10 inch non-stick pan Ms. Nguyen's recipe calls for. The texture of the Andrea Nguyen crepes was definitely better--nice crispy exterior with a slight chew. You can sort of tell by looking at the pictures, these have a nicer sheen. But I will definitely continue to use both recipes. I like that the Duguid/Alford recipe can be whipped up without too much foresight. thaiobsessed wrote: So, I went back and actually READ the recipe I've been using as a guideline. This made me smile, glad to see I'm not the only one. Thanks for bringing us on your journey, I'm always amazed at how much one can learn though trial error and repetition for a simple recipe, much less a slightly more involved one like bahn xeo. This is really fun for me to read because one of the first "debates" I had in the lth shopping & cooking index was whether mung beans were an essential or even valid ingredient in Ban Xeo. My Vietnamese friend made them from scratch for us once and wrote the recipe down and it definitely called for mung beans, which he pureed in a blender. I'll have to re-visit his scribbled recipe. But this post also reminds me of my recent quest to learn how to make Swedish pancakes not from the Lundt box mix (which really is decent) but from scratch like my Grandma Ruthie did. The more you do it and experiment and screw up and burn things and get to know your pan . . . well it's pretty great to slowly get better at something by just doing it over and over again. And it's also wonderful to be reminded how much a Swedish pancake and a Vietnamese "crepe" have in common, even though they are rather different. Food is pretty great, isn't it? 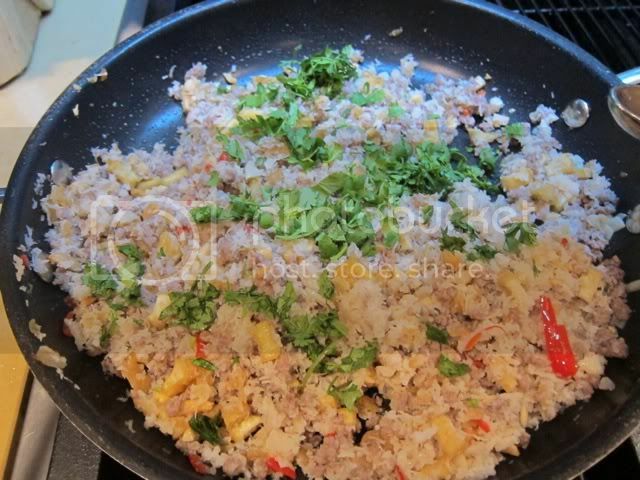 What do you like and dislike about banh xeo? - texture: do you prefer it to be crunchier or chewier? - filling: I am not fond of cooked bean sprouts. 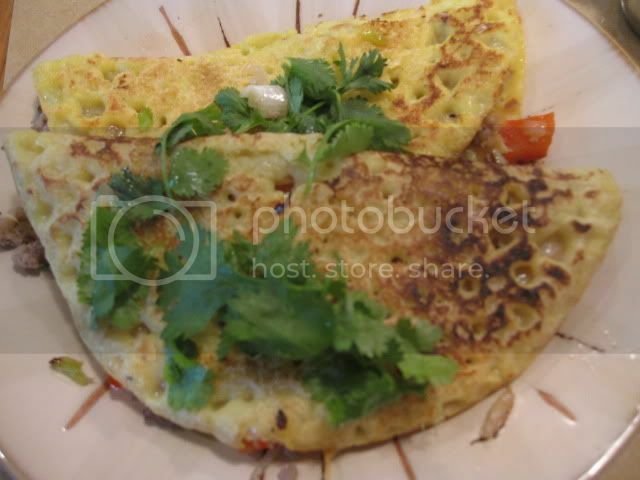 What other types of veggies do you think it may work on banh xeo? 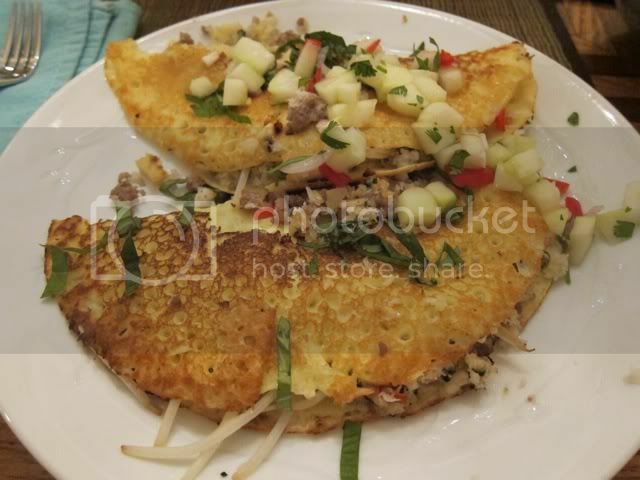 A traditional banh xeo have shrimp and pork inside. I can see it would work with chicken as well. Any other types of meat/fish do you recommend? 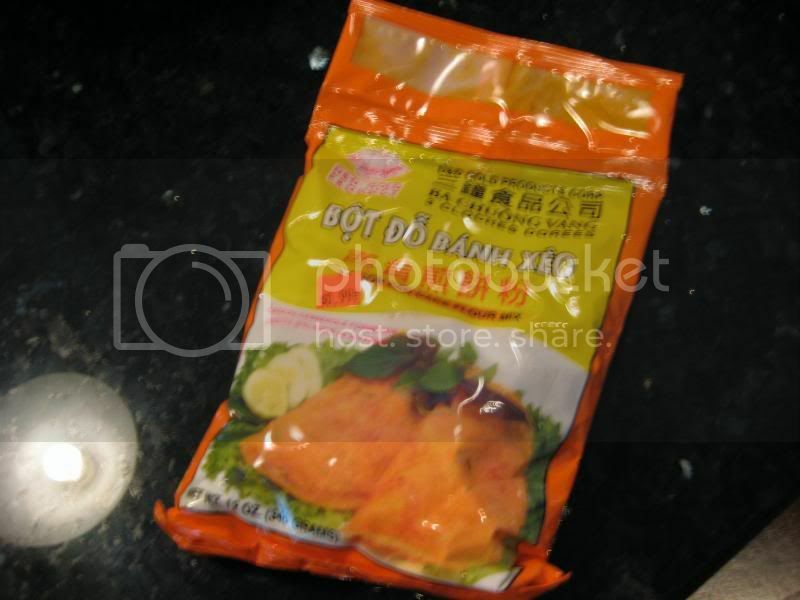 - dipping sauce: for those who can't stand the smell of nuoc mam, would an alternative hoisin-based sauce or soy sauce/vinegar combo work? 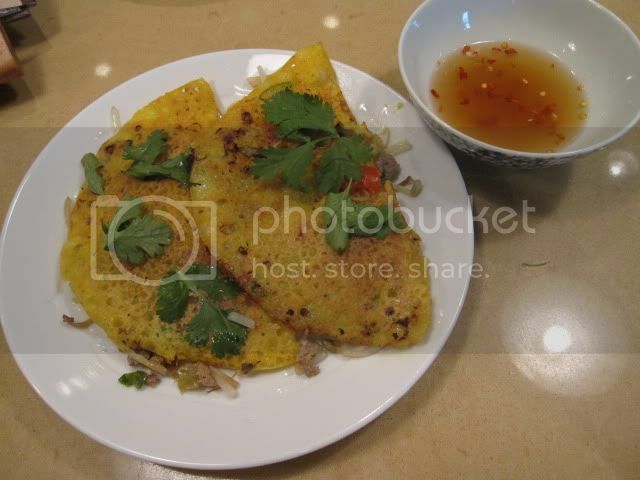 Nghe wrote: What do you like and dislike about banh xeo? I've made these a bunch and only done the traditional filling (strips of pork, shrimp, bean sprouts) once. I'm planning to make the Thai version of this (Khanom BuangYuan) with coconut, roasted peanuts, fried tofu (I plan to substitute ground pork) and pickled radish. I like the crepes a little crispy on the outside. I'm a big fan of fish sauce so the sauces you propose would be a letdown for me (though, I imagine, not for someone who doesn't like the smell of fish sauce). 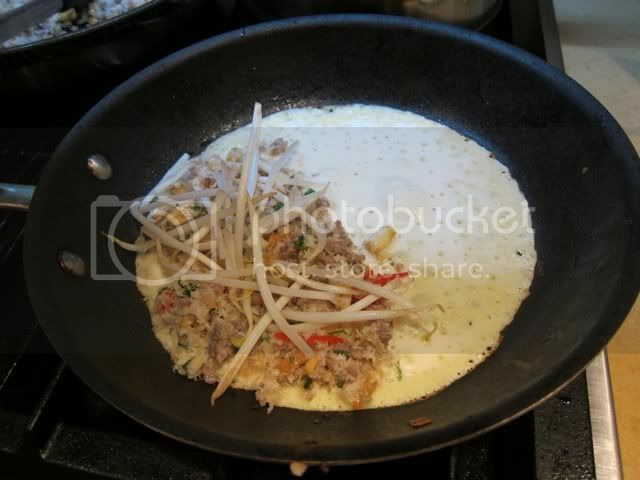 I made the Thai version of banh xeo (kanom buang yuan) based on the menu description at Spoon and a hybrid of a few recipes I found on the internet. Filling included ground pork, coconut, palm sugar, peanuts, garlic, lemongrass, cilantro, chiles, fish sauce, among other things. I served it with Thai basil and ajad (Thai cucumber relish). I really liked it, though I'm planning a few tweaks to the recipe next go-round.